Drunk driving, whether that be in a car or in a boat, is one place where I actually feel the legal penalties are too lenient. If a person, uninfluenced by booze, drove a car or a boat recklessly and hurt or even killed someone, they would get a more severe sentencing in many jurisdictions than doing the same thing while drunk, “under the influence” as the legal saying goes. In past ages, drinking and still being able to drive, whether that be a car or boat, might have been considered a badge of honor in certain circles. Today, thank goodness, it is considered reckless lunacy. And things are worse on the water than on land. This column is about that. Often times, when I come in from a boat ride with the family, some of the more lubberly members of the family say, “I can still feel the swaying!” If they happen to jump in the shower, it really gets intensified and they joke that they had to hold on to the shower wall to keep from tipping over! This is clear evidence of the dramatic impact the marine environment has on the body’s sensory perception system. While boating, we are confronted with conflicting information from the eyes, feet and inner ear. The horizon is constantly moving – up, down and sideways – as the boat moves beneath our feet. Our conscious brain has no problem with intellectualizing this. But the unconscious part of our brain is getting sensory overload. This can result in reactions ranging from slight queasiness to absolutely debilitating nausea. The marine environment is full of “stressors” – the sun, glare and vibration, to name a few, are all pretty common. Stressors intensify the effects of alcohol, drugs and some medications. They can cause fatigue, reduced coordination, weak judgment and slow reaction time. And forget about the vision of the St. Bernard saving you from the cold by giving you brandy. Alcohol makes the body more susceptible to the effects of cold water, not less. Not surprisingly, all of this adds to boating accidents. U.S. Coast Guard data shows that, in boating deaths involving driving under the influence, more than half the victims capsized their boats and/or fell overboard. Over one in five boating deaths are linked to the use of alcohol. Every state in the Union prohibits the operation of a boat while under the influence of alcohol. 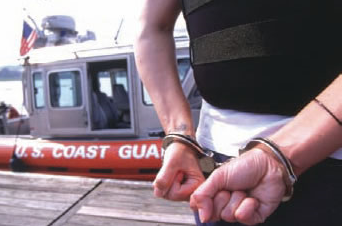 The Coast Guard, as a federal entity, enforces a federal law that prohibits Boating Under the Influence (BUI). This law pertains to every vessel, foreign or domestic, operating in U.S. waters, as well as U.S. vessels on the high seas. Penalties may include fines, jail, impoundment of boats, and in some states the loss of boating and/or driving privileges. In 2008, Operation Dry Water was started by the U.S. Coast Guard, the National Association of State Boating Law Administrators and partner agencies. It is a national weekend of BUI detection and enforcement aimed at reducing the number of alcohol-related accidents and fatalities, and fostering a stronger and more visible deterrent to alcohol use on the water. This year’s program was held the weekend of June 27-29. Zero tolerance is of course the posture, then and now. Booze kills.